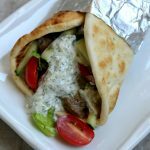 Yes, I know I’ve made chicken gyros and pork gyros and now I’ve made slow cooker beef gyros (this is an updated recipe from 2012). They are all so tasty and a perfect slow cooker summer dinner (have you seen my 100 Days of Slow Cooker Summer E-Book yet?). 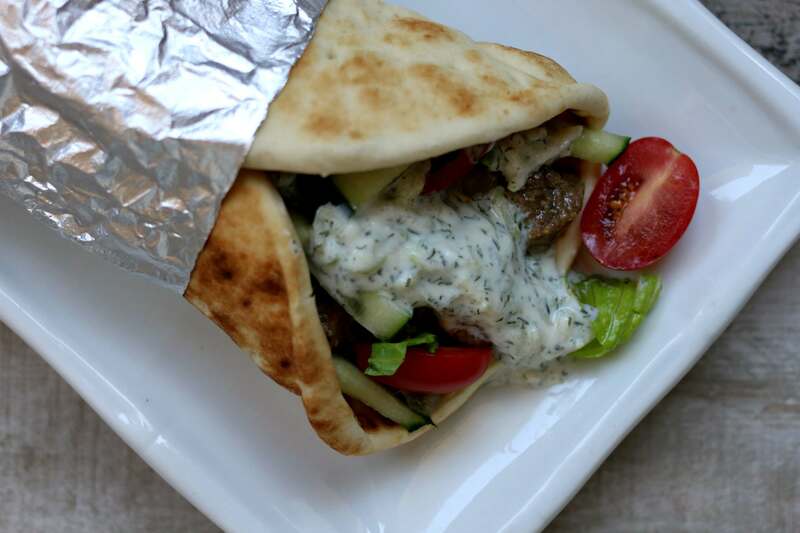 Basically, I’m in love with any type of food that you wrap up in soft pita bread with a creamy sauce. I can’t emphasize enough how great the slow cooker is in the summer. NO HEAT! The slow cooker doesn’t heat up your kitchen. We are at over 100 degrees here today so that is sooooo appreciated. Get all my new slow cooker recipes! tender. (If it’s not tender, it’s not done yet). I use a 3 quart slow cooker for this recipe. 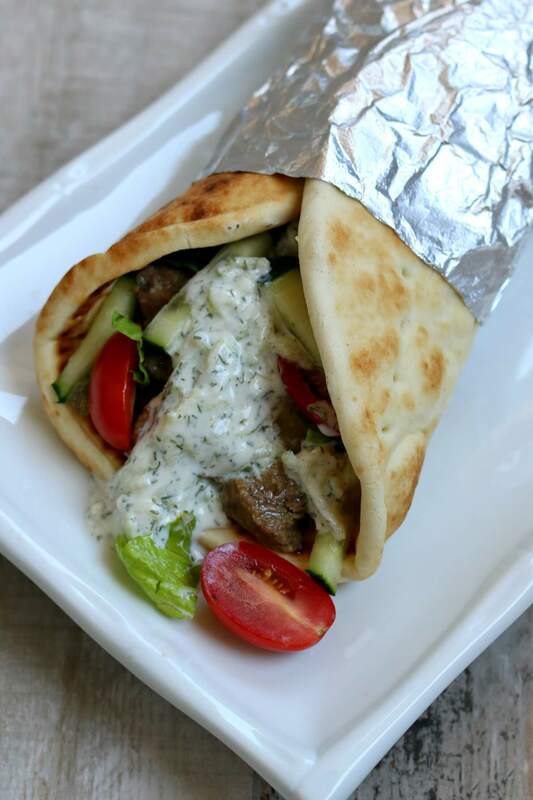 Just a heads up that your recipe for Beef Burgundy keeps redirecting to this Gyros page. I can view the Beef Burgundy recipe from search results, but as soon as I try to view it on its own page it just redirect here. Both look yummy, though! Thanks for letting me know! I will have it fixed. Excited to try this tomorrow. Do you brown the meat before you add it to the crock pot? Thank you. you can, but I don’t! So I just discovered your blog today and I’m super excited. I have two young ones and I love the crock pot recipes because it is done and ready too go at the end of the day. Can you please add me to your email list. I can’t wait to try this gyro recipe!! I have a gluten allergy so I am going to try it in a lettuce wrap! Would you like to get all my posts by email? I can add you to my email list if you’d like? Or do you need the RSS feed? Love this recipe!!! Kids lick their plates. Trying it with chicken tonight!!! I did marinade it a little bit. Great make ahead dinner too. Can you do this on high for half the time? We had this for dinner tonight and it was so good! It's really easy to throw together too. This is definitely added to my go-to recipes! I really love this recipe. I have made it a few times at home. Tried making it at my mom's house in her crock pot today and the beef totally burned! Not even edible! 🙁 I had it on low… Maybe a faulty crock pot? oh that is so sad. I'm sorry. Yes, I would maybe get her a new crockpot. Some of them cook so very hot! Each cooks differently, for sure. Question…when you say toss in sliced onions, do you mean stir them in, or place on top only? It really doesn't matter! Either way, it will work out fine. Hooray Erica!!!! Glad you liked it! Hey Karen, I'm a bit of a slow cooking n00b. I was wondering if the chuck roast was cut and sliced before cooking or sliced after browning and then placed in the slow cooker. Any help is much appreciated, your blog is great and as a college student is an amazing resource. This was easy to make and delicious! Thanks for the recipe! I know, right? I love gyros too!! Thanks so much, Ben. The moment I saw Gyro, that was it for me!!! Ha Ha Ha ! But I wanted to say thank you as well for all the quality recipes! And I'll definitely spread the word! What an awesome idea! I think I will make a few up and bring them with me to my in~law's for Christmas. I'll even bring my crock pot along to make up a batch for everyone! Thank you and Merry Christmas!